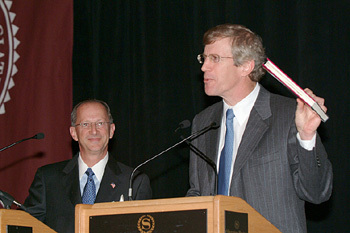 Associate Justice Robert J. Cordy (right) of the Supreme Judicial Court holds up "The Rule of Law in America," a book by Ronald A. Cass, dean of the Boston University School of Law, during a debate with Cass (left) at Annual Conference 2003. The fiscal crisis in Massachusetts' courts system - and what lawyers and the legislature can do to deal with it - became a central theme echoed throughout the MBA's three-day Annual Conference 2003. From opening remarks at the House of Delegates meeting on Jan. 23 through Saturday's closing lunch two days later, courts budgets, past and pending layoffs, curtailed services, as well as solutions, new technologies and lobbying efforts were all debated and explored. Hill & Barlow was much more than a law firm. It was a destination — a launching point that developed the careers of many of Boston’s top attorneys in an environment that was as much family as it was institution. History, prestige and high-profile clients weren't enough to save Hill & Barlow.